No hot water, dirty sheets, sheets and blankets with holes, overall hotel is dirty, pool water was cloudy. We will not stay here again. Be mindful of your actions when you travel and avoid making the same boo-boos as these celebrities. Stay at these lovely hotels when you visit Davao. Have a fun-filled city adventure at any of these hotels! Get your money’s worth at these inexpensive hotels in Davao. More than just a hotel in Davao City, Quoyas Inn is a place where guests can find comfort that you won't find anywhere else. Quoyas Inn is located at Kilometer 7 along Diversion Road, just 3 kilometers away from the Francisco Bangoy International A... More than just a hotel in Davao City, Quoyas Inn is a place where guests can find comfort that you won't find anywhere else. Quoyas Inn is located at Kilometer 7 along Diversion Road, just 3 kilometers away from the Francisco Bangoy International Airport. Its distance from the airport make it an ideal place to stay, especially for jetsetters. Whether you're in Davao City for business or pleasure, the inn's warm and homey ambiance is a welcome treat. Quoyas Inn offers simple yet practical amenities and services that make for a hassle-free stay. The hotel features a 24-hour front desk to assist you with checking in and out. Free WiFi is available in some public areas across the property. You may also avail of services from the hotel's tour desk, especially when planning your itinerary in the city. For guests who bring in their own cars, there are free parking spaces available. Following a simplistic and minimalist design, the rooms are sparsely decorated, aiming to create a more laidback and simple atmosphere to make guests feel at ease. The accommodations feature a shared bathroom with a shower. Hair dryers can be requested at the inn's front desk. Earn as much as 77 GetGo points. Infinity Suites offers 25 exquisitely designed suite rooms that are fully-equipped with modern amenities. It captures the minimalist concept to ensure quality relaxation that will surely make our guests feel the comfort from within. Infinity Suite... Infinity Suites offers 25 exquisitely designed suite rooms that are fully-equipped with modern amenities. It captures the minimalist concept to ensure quality relaxation that will surely make our guests feel the comfort from within. Infinity Suites is accessibly located at the corner of Porras and Palma Gil Streets near University of Southeastern Philippines Gymnasium and Cultural Center. Public vehicles are just right at lobby entrance to shuttle guests to any destination in the city. Earn as much as 420 GetGo points. Princess Perrine Suites is located near tourist attractions such as Apo Golf and Country Club, Talomo Beach and Eden Nature Park. 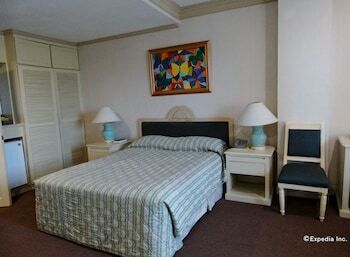 All rooms are with air-conditioning, cable TV and free WiFi. Earn as much as 100 GetGo points. The Metropolis Suites Davao offers you posh and contemporary living spaces for your sojourn in the vibrant city of Davao. Situated along Cabaguio Avenue corner Macopa Street in Davao City, the hotel is a few minutes' drive to the city center. It is ... The Metropolis Suites Davao offers you posh and contemporary living spaces for your sojourn in the vibrant city of Davao. 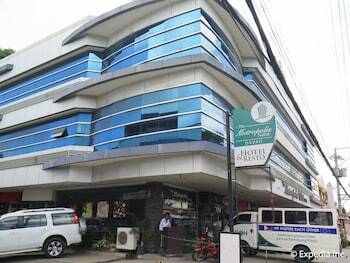 Situated along Cabaguio Avenue corner Macopa Street in Davao City, the hotel is a few minutes' drive to the city center. It is just a 5-minute drive to the city's top shopping malls, which include Abreeza Mall, SM Lanang Premier, Victoria Plaza, and Gaisano Mall. The Metropolis Suites Davao is a great base from where to discover the numerous attractions in the peaceful but vibrant Davao City. The hotel's guestrooms are modern and tastefully-designed, with a dash of eye-popping colors and refined furniture in the interiors. Room amenities include full air conditioning, free WiFi access, flat screen TV with satellite channels, minibar, and coffee and tea makers. Bathrooms and toilet are en suite and equipped with hot and cold showers as well as bathtubs, and provided with choice toiletries for your convenience. Rooms are kept clean with daily housekeeping. The Metropolis Suites Davao features a coffee shop where guests can lounge in for hot drinks and pastries. For transactions, there is a business center that provides services such as document printing, photocopying, and fax. The smoke-free property also features a function room, parking spaces, and a 24-hour operational front desk with vault storage for the valuables of tourists. The hotel also offers tours and laundry services. Davao is easily accessible from Metro Manila, with direct flights via commercial airlines available daily. The airport is only a 15-minute drive from the hotel, ideal for those who need to catch an early flight. Earn as much as 367 GetGo points. 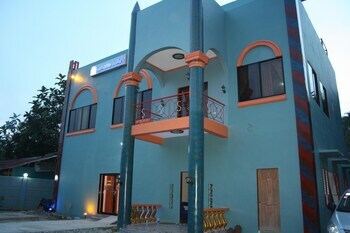 White Mansion is located at 14 Alaminos Street, Rolling Hills Subdivision, Bacaca Road, Davao City. By staying here, guests are treating themselves to first class comfort but at a very reasonable price. It is right in the heart of Davao City and is c... White Mansion is located at 14 Alaminos Street, Rolling Hills Subdivision, Bacaca Road, Davao City. By staying here, guests are treating themselves to first class comfort but at a very reasonable price. It is right in the heart of Davao City and is close to beaches, mountains, and even all the conveniences of a modern city. Earn as much as 520 GetGo points. Every vacation is not complete without a comfortable and convenient hotel that has all your basic accommodation needs covered. Boasting a polished modern overall design, Be-ing Suites is located within Guadalupe Village in Lanang. Only 3 kilomete... Every vacation is not complete without a comfortable and convenient hotel that has all your basic accommodation needs covered. Boasting a polished modern overall design, Be-ing Suites is located within Guadalupe Village in Lanang. Only 3 kilometers from Francisco Bangoy International Airport, the hotel is within driving distance from Davao's city center and its business and commercial districts. Airport and city transfers are offered onsite for your convenience while parking spaces are available for guests with private vehicles. Be-ing Suites offers a total of 16 rooms, with 12 standard rooms and 4 deluxe rooms in its roster. Each studio unit is equipped with air conditioning, flat screen cable TV, work desk, wardrobe, electric kettle, and an en suite bathroom complete with toilet and bidet, hot and cold shower, sink, towels, and bath essentials. Deluxe rooms have added kitchenettes complete with kitchen counter, sink, and a mini fridge. Hotel guests are entitled to complimentary breakfasts and free use of the WiFi. Spend your leisure time in the swimming pool or the hotel's terrace and garden area for some peace and quiet after an exhausting day of touring the city. While staying at Be-ing Suites, you can also avail of tours and laundry services. Earn as much as 282 GetGo points. Whether you are travelling to Davao City for business or a holiday, Orange Grove Hotel offers the perfect accommodations that will make you feel right at home. Each guestroom at Orange Grove Hotel is designed with your comfort and convenience in mind. The rooms have refrigerators, minibars, work desks, phones and a flat-panel cable TV. They also each have an en suite bathroom with toilet, shower, and free toiletries. You may also order for room service if you wish to dine in the comfort of your room. Orange Grove Hotel has a 24-hour front desk, and offers free roundtrip shuttle services to the Francisco Bangoy Airport, which is just 10 minutes away. Guests who bring their own vehicles can use the free parking spaces onsite. For business travelers, the hotel has its own business center. Meanwhile, everyone can enjoy delightful meals at the in-house restaurant and cafe. Earn as much as 349 GetGo points. With its old world charm and array of features, Humberto's Hotel makes you feel right at home when vacationing in Davao City. Tucked in Jose Palma Gil and Padre Gomez Streets, Humberto's Hotel is quite near Davao City's tourist offerings, just a few... With its old world charm and array of features, Humberto's Hotel makes you feel right at home when vacationing in Davao City. Tucked in Jose Palma Gil and Padre Gomez Streets, Humberto's Hotel is quite near Davao City's tourist offerings, just a few minutes' drive including the shopping malls. The highly urbanized and bustling city of Davao presents a lively experience for visitors—its rich cultural heritage along with its accessibility is what entice tourists to visit this wonderful city. Direct flights from Metro Manila via commercial airlines are available daily. Francisco Bangoy International Airport is only 8 kilometers away and can be reached with the hotel's convenient airport transportation. The hotel has 20 guestrooms, all of which are quaint, cozy, and fitted with basic amenities to make your Davao City vacation all the more memorable. Guests are welcomed to chic and fully air conditioned accommodations that feature a 20" cable TV, minibar, and telephone. Each room is equipped with a private toilet and bath complete with a hot and cold shower. During your vacation in the "Crown Jewel of Mindanao", Humberto's Hotel sees to it that you make the most out of your stay with its onsite facilities including a massage parlor, WiFi internet access, laundry services, and a business center. Its onsite restaurant offers local and international dishes to satisfy any palate. Earn as much as 277 GetGo points. Have a pleasurable stay at an accommodation in Davao Oriental that treats you as if you are royalty. Situated in Mati City, Señorita Suites can be found at Señorita Complex inside Archie Heights Lopez Subdivision. An ideal lodging for both business ... Have a pleasurable stay at an accommodation in Davao Oriental that treats you as if you are royalty. Situated in Mati City, Señorita Suites can be found at Señorita Complex inside Archie Heights Lopez Subdivision. An ideal lodging for both business and leisure travelers, the hotel offers well-appointed modern rooms to keep you comfortable. It is 69 kilometers away from Davao City's Francisco Bangoy International Airport. From there, you can reach the hotel after 3 to 4 hours of land travel. Seek sanctuary in any of the accommodation's 11 cozy rooms fitted with convenient amenities. All rooms at Señorita Suites are air conditioned and feature private toilets and baths with hot and cold showers and bidet, cable TV, working desk, and WiFi access. You can request for massages or order food from the comfort of your own hotel room. Everything they need is in Señorita Suites. Guests are entitled to complimentary breakfast during their stay. There are conference rooms for business meetings and events, as well as free WiFi accessible in the public areas. In addition, the suites has an onsite restaurant, a snack bar, and parking spaces allotted for guests who bring their own vehicles. The 24-hour front desk offers assistance in booking tours and storing luggage. Earn as much as 245 GetGo points. Aljem's Inn – Rizal offers value-for-money accommodations for Davao City travelers who are on a budget. Situated at 49 Dizon Building in Rizal Street, the inn is within walking distance to some of the top tourist spots in the "City of Royalties", lik... Aljem's Inn – Rizal offers value-for-money accommodations for Davao City travelers who are on a budget. Situated at 49 Dizon Building in Rizal Street, the inn is within walking distance to some of the top tourist spots in the "City of Royalties", like People's Park, and Monument of Peace and Unity. 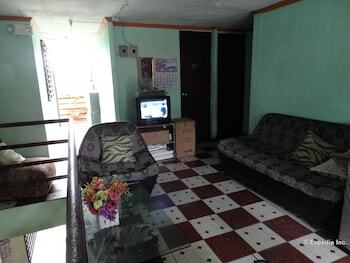 It is also conveniently located just 8 kilometers from Francisco Bangoy International Airport. Direct flights are available daily via commercial airlines so getting in Davao City would be a breeze. Aljem's Inn – Rizal offers 18 non-smoking rooms featuring comfortable beddings coupled with basic amenities for a hassle-free stay. Each room is also fully air conditioned and equipped with a private bathroom complete with toilet and shower. Additionally, a cable TV, WiFi access, and a telephone can also be found in each room. Housekeeping is provided daily. Aljem's Inn – Rizal has a variety of onsite facilities for the discerning traveler. Complimentary breakfasts are served at the guesthouse's dining hall. The 24-hour front desk is manned by a polite staff ready to assist you with all your needs and concerns. You can also use the hotel's free WiFi in the public areas if you wish to go online. Known as the "Crown Jewel of Mindanao," Davao City's urban jungle and cultural hubs attracts visitors from all over the world, especially during the month of August when the city holds the annual Kadayawan Festival. Earn as much as 210 GetGo points. Earn as much as 396 GetGo points. Although young, Star Hotel Davao aims to provide guests only the best comforts they deserve. They target the sweet in-between of quality, immaculate lodgings and affordable, reasonable prices. It's the age-old cliché, but they believe in putting... 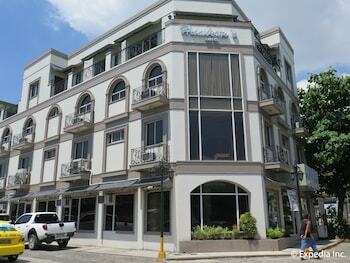 Although young, Star Hotel Davao aims to provide guests only the best comforts they deserve. They target the sweet in-between of quality, immaculate lodgings and affordable, reasonable prices. It's the age-old cliché, but they believe in putting guests first to pen Star Hotel as your "home away from home." They aim to offer the warmest of welcomes to all guests through creating exceptional yet heartfelt experiences; to create opportunities for growth for each and every associate; and to spur social progress within the community. Earn as much as 320 GetGo points. Davao Hub Bed and Breakfast was built with a vision of making guests feel they're at home whenever they stay within the four corners of the hotel. Amidst the city noise and busy streets of Davao, efforts are always geared towards giving guests a cozy... Davao Hub Bed and Breakfast was built with a vision of making guests feel they're at home whenever they stay within the four corners of the hotel. Amidst the city noise and busy streets of Davao, efforts are always geared towards giving guests a cozy home away from home. Part of the business name is "hub" which means common connection point or core; making sure that the hotel connects with them as they realize that at the end of the day, hospitality and services offered by Davao Hub and Breakfast is the core of their stay at the hotel. Earn as much as 195 GetGo points. Earn as much as 429 GetGo points. Situated at Ecoland Drive in Matina Aplaya, Davao City, just 2 minutes away from SM City, Sharana Pensionne offers quality rooms namely condotype, dormitory, double and family at a low price. Each is equipped with air conditioning unit, cable TV, toi... Situated at Ecoland Drive in Matina Aplaya, Davao City, just 2 minutes away from SM City, Sharana Pensionne offers quality rooms namely condotype, dormitory, double and family at a low price. Each is equipped with air conditioning unit, cable TV, toilet and bath, sink, toiletries and towels. Some are equipped with kitchenette and a living room as well. Earn as much as 150 GetGo points. Earn as much as 196 GetGo points. Earn as much as 180 GetGo points. Earn as much as 165 GetGo points.